What is the City of Astronomy? Our city, Pasadena, is the City of Astronomy! Pasadena has been a special place for astronomy for more than 100 years. Many significant discoveries in Astronomy including magnetic fields in sunspots, the expansion of the universe, and the first evidence of the dark matter have been made by Pasadena astronomers or astronomers using facilities enabled by the City of Astronomy. With its rich history in astronomy, Pasadena has become a nurturing ground for innovations and producing a series of cutting-edge discoveries. Eleven Pasadena-based scientific institutions and organizations partnered to celebrate Pasadena as the “City of Astronomy.” The premier institutions involved include Caltech, Carnegie Observatories, Giant Magellan Telescope, IPAC, NASA's Jet Propulsion Laboratory, Kidspace Children's Museum, Mt. Wilson Observatory, Pasadena City College, The Planetary Society, Thirty Meter Telescope and the ArtCenter/Williamson Gallery. These world-renowned institutions are collaborating together to promote greater public awareness about Pasadena’s rich history in the field of astronomy. Where is the City of Astronomy? 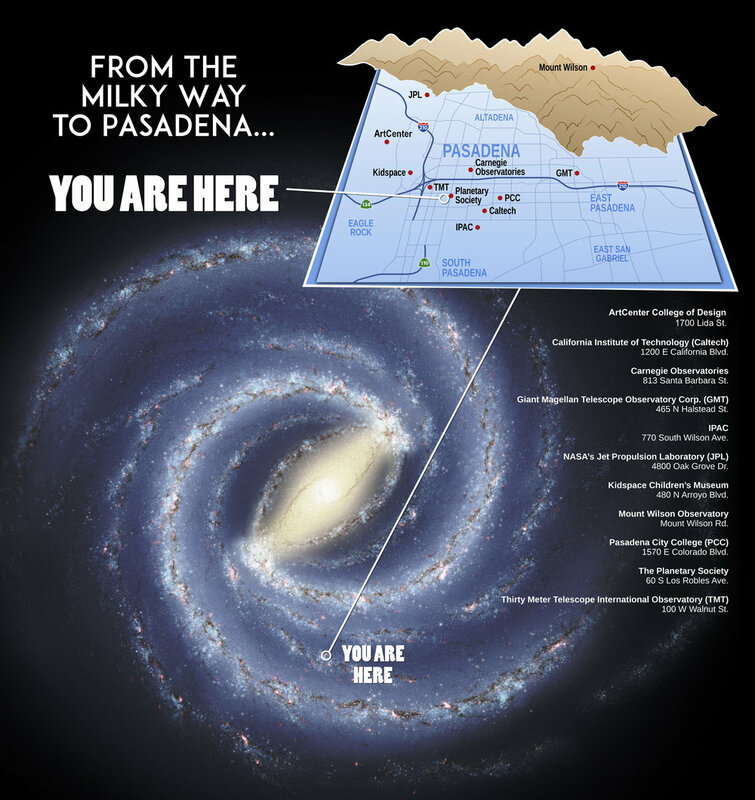 Pasadena is located in California, the United States, the Earth, the Solar System, the Milky Way Galaxy.